One of my favorite retailers, Jayes Studio, asked me to host a giveaway this month. Needless to say, I was thrilled to be asked since I have loved their products since I discovered them during a One Kings Lane sale a while ago. And I of course have purchased several items from them since. I couldn't help myself! Their products come in the freshest colors and patterns, how could I not make several purchases? I figured that today would be especially fitting for the day to kick off the giveaway because it's my birthday (the big 3-0)! But enough about me, let's talk about how you can get your hands on a Jayes Studio item for free! 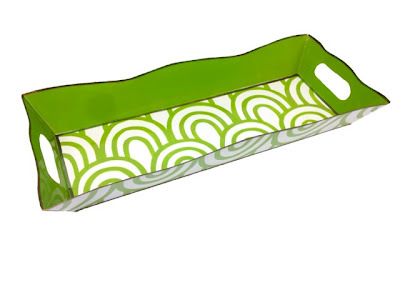 This delightful vanity tray is the item that we'll be giving away today. All you need to do is head over to Jayes Studio's Facebook page and "Like" them. Then head on back over here to leave me a comment below letting me know you "Liked" Jayes Studio and you'll be entered to win the Scales Vanity Tray below! There will be a random drawing next Thursday, 4/12 where I will announce the winner of this giveaway. Make sure to enter before it's too late! *You must have a US shipping address to enter, and there will be no exchanges for the vanity tray. First of all, Happy Birthday!! I liked Jayes Studio. I hope you love your birthday. I have liked Jayes, but actually I LOVE Jayes Studio, as does my house. Thanks!!! Happy Birthday!! I like Jayes Studio on Facebook and love their products!! I liked Jayes Studio on FB, and would LOVE one of their gorgeous pieces in my home! Hey Amanda! Congratulations! You are the winner of the Jayes Studio Giveaway! Feel free to send me your name, shipping address, and phone number. Jayes Studio will ship it to you directly :) Thanks for participating!!! Happy Birthday!! I have already liked Jayes Studio and love their products!! I liked Jayes Studio on Facebook! They're the best! HaPpY BiRtHdAY!! I am a fan and "like" Jayes Studio! Happy Birthday!!! I "liked" Jayes studio!!! Happy Birthday! If there was a love option on Jayes Facebook page I would have clicked it! I like Jayes on Facebook, and this tray is fantastic!! Happy Birthday! Looks like you have many things to look forward to in the upcoming months! (I actually had a birthday this past Monday!) So glad Jayes Studio has introduced me to your site which I look forward to becoming more acquainted with! I became familiar with Jayes Studio during a recent OKL sale as well & ordered a beautiful serving tray which I can't wait to receive! I would LOVE to acquire more of their pieces for my homes! Happy 30th Birthday!!!! Wow, you are a baby!!! Congrats! I would love to win this!!! Come see me sometime! I love following your blog! Happy Birthday Christina! I'd never heard of Jayes before so I checked out their FB page and "liked" them- they have cute stuff! Liked Jayes Studio on Facebook. I liked jayes on fb! Happy birthday sweetie, my daughter and partner just turned 30! Christina I like Jayes Studio on Facebook. I adore this special tray! Oh and Happy Birthday!! Enjoy an amazing year ahead!! I "LIKED" Jayes FB page! This little tray is so wonderful! Thank you for hosting! Happy Birthday! Liked Jayes Studio on Facebook. Happy Birthday - at 30, you're just getting started. Enjoy the ride! And, of course, I liked the tray on fb. I liked Jayes Studio on facebook--but I LOVE them! I like Jayes Studio on FB. Would love a tray! I already 'like' Jayes on FB and have been crushing on all of their fine pieces for some time. I'd love to add the lime tray to our already preppy home :) Thru Jayes I am now following you on FB as well, thanks for such a wonderful giveaway...fingers crossed! Liked! And love your blog! Instead, let them know you willing to listen when they want t shirt painting to talk, or just hang out when they don Comfort for someone with PTSD comes from feeling engaged and accepted by you, not necessarily from talking.Do things with your loved one, things that have markiplier shirts nothing to do with PTSD or the traumatic experience. Encourage your loved one to participate in rhythmic exercise, seek out friends, and pursue hobbies that bring pleasure. Take a fitness class together, go dancing, or set a regular lunch date with sloth shirt friends and family.Let your loved one take the lead, rather than telling him or her what to do.